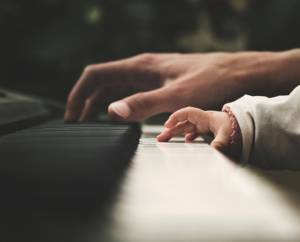 WHEN IS MY CHILD READY FOR MUSIC LESSONS? Do you have a little one who seems to respond to music? Maybe your baby’s face just lights up when you sing to him or her. Maybe your two-year-old is already singing along with you in the car or clapping and dancing to the beat. Maybe your three-year-old’s favorite toys are the percussion instruments and piano in your home. For now, let’s use piano as an example, since piano is the best instrument for a solid base in music education. Four years old is typically the “golden age” for any child to begin formal piano lessons, (FYI- percussion and violin as well!). At four, a child typically has learned their letters, can sit through a half hour lesson, and has developed the motor skills involved in playing the instrument. Many parents of three-year-olds will come to me and say, “My child meets all these criteria. Can we start lessons?” And my answer is always, “Well, let’s give it a try!” There is no harm in scheduling a few trial lessons to see how your little one responds. Sometimes they do great, and lessons can always be customized. If your little one loves music, but formal lessons are a bit too much for their developmental age, then I always suggest Mommy and Me group classes. They are typically really well structured and will feel more like a play date than a lesson. Your child will be introduced to all types of music and all the various instruments. They will also learn basic music skills such a rhythm and pitch matching while nurturing a positive association with music through fun and playing! Mommy and Me classes can start as early as 6 months old.